In December 2016, a Texas nonprofit called the Refugee and Immigrant Center for Education and Legal Services welcomed more than 400 undocumented women and children to its shelter in San Antonio, after a judge ordered federal authorities to release the immigrants from a family detention center. The court ruling generated national headlines that helped RAICES raise $100,000, a sizable haul for the legal-aid group. “At the time, we were really blown away,” recalled Jenny Hixon, development director for RAICES. But that was nothing compared to the last two weeks. One night earlier this month — amid nationwide outrage over the Trump administration’s “zero tolerance” immigration policy, which has forced more than 2,500 migrant children to be separated from their parents at the border — Hixon received an unexpected email from a married couple in the Bay Area, Dave and Charlotte Willner. 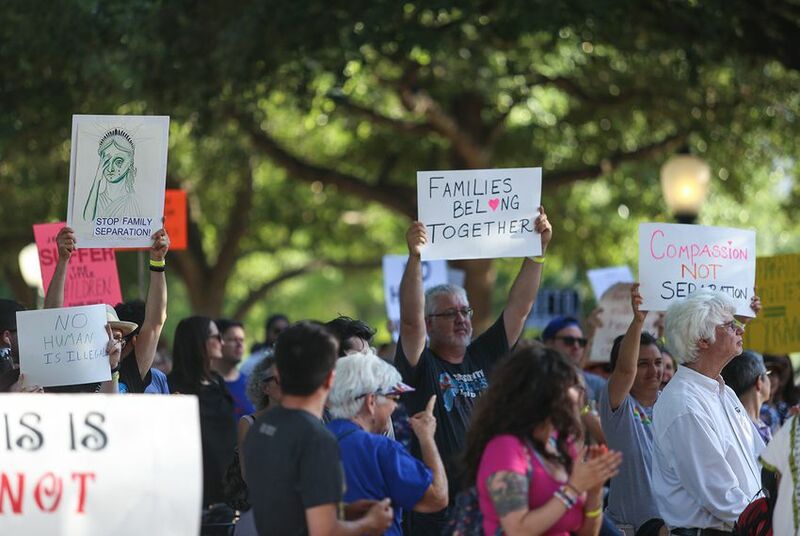 A Facebook page the Willners had started just a few hours earlier to raise money for RAICES was taking off faster than expected as people across the country reacted with horror to photographs and news stories documenting family separations. With any luck, the couple predicted, the campaign might even break a million dollars. Over the next week and a half, the Facebook page quickly transformed from a promising online fundraiser into a viral phenomenon, generating around $20.5 million, three times RAICES’ annual budget and more than 40 times what the nonprofit raised in the entirety of 2017. The fundraiser has drawn support from celebrities like Jimmy Fallon, who made a donation to RAICES this week in Donald Trump’s name. In addition to the funds donated on Facebook, RAICES has received $5 million in contributions through its official website, which briefly crashed last week because of increased traffic. The organization plans to use that money to pay for legal representation for separated families and to hire new attorneys to bolster its staff of 65 full-time immigration lawyers. Hiring a lawyer to represent an immigrant with a claim to asylum typically costs between $1,000 and $10,000, according to Jason Finkelman, a Texas-based immigration attorney who is not affiliated with RAICES. More complicated cases lead to higher fees, Finkelman said, and those involving children and spouses often generate especially significant expenses. “There’s no such thing as a cookie-cutter immigration case,” he said. RAICES is hardly the first nonprofit to receive an unexpected cash windfall with the help of social media. In 2014, the ALS Association — a group that raises money to support research into amyotrophic lateral sclerosis, better known as Lou Gehrig’s disease — generated more than $100 million through the viral "ice-bucket challenge," in which participants posted videos on Facebook of ice-cold water being poured over their heads. As RAICES begins using its newfound resources, the nonprofit would do well to emulate the ALS Association’s example, said Tim Seiler, former director of Indiana University’s Fund Raising School. Before it spent the money generated by the ice-bucket challenge, the ALS Association solicited input on how to use the funds from a panel of advisors that included patients living with Lou Gehrig’s disease. Seiler said RAICES should copy that approach by seeking advice from local community members invested in supporting immigrants. RAICES was founded by South Texas activists in 1986 as waves of Central American immigrants entered the United States. In its early years, the nonprofit — known at the time as the Refugee Aid Project — provided clothing and medical help to migrants, said John Blatz, an attorney who has worked for the organization for decades. RAICES now has offices throughout Texas, including three sites in San Antonio. That 30-year history of immigration activism should assure potential donors that RAICES is a trustworthy steward of the millions of dollars flooding its coffers, Hixon said.